quarter. The fumble was recovered by Nate Jackson. Hawaii then drove for a touchdown. There's no Bowl Championship Series game for anyone in the WAC this year, but don't tell that to Hawaii defensive tackle Lance Samuseva. "This was a big game for us, like a BCS bowl," Samuseva said. "That's how we looked at it." In a victory that was sweeter than any $11 million payout, Hawaii surged back from a 14-point second-half deficit to stun No. 18 Fresno State 38-34 last night -- Hawaii's first win over a ranked team since beating No. 4 Brigham Young 59-28 on Dec. 1, 1990. A crowd of 35,074 at Aloha Stadium went wild, and television viewers across the country were treated to a game that featured three lead changes in the final 3 minutes and 15 seconds. Hawaii coach June Jones said FSU may be more talented, but UH won by playing together. "It's one of those feelings you have only once or twice in a lifetime with certain teams. Even though we're probably not as good as Fresno physically across the board, the togetherness, the building relationships, those things mean more," Jones said. Hawaii to within 3 in the fourth quarter. "(Fresno State) played as good a game as they did this year. We beat them. That's the bottom line." Toppling the conference coverboy Bulldogs kept alive the Warriors' chances of winning the WAC. With its fourth-consecutive victory, UH is now 5-2 and 4-2 in the league. FSU -- undefeated and eighth in the country two weeks ago -- fell to 6-2 and 2-2. "Look up at that scoreboard. This is huge what we just did," said defensive end Travis Laboy. "We just beat the 18th-ranked team in the country. We never gave up. We knew it was just a matter of executing and we knew we could come up with a win." Said quarterback Nick Rolovich: "I'm glad everyone could see that we're for real on the islands. We never doubted each other. They played incredible defense. They shut down a lot of the stuff we were trying to do. We took what they gave us for a while." The final score, Ashley Lelie's third touchdown catch of the game, a 14-yarder from Rolovich, came with 13 seconds left. "That Ashley Lelie just ate us up," Fresno State coach Pat Hill said. So did safety Nate Jackson, whose left leg looked like a shark ate it up after a motorcycle accident Monday. FSU had the ball and a 34-31 lead with little more than three minutes left when Jackson blindsided Carr on a blitz, forcing Carr to fumble. Laanui Correa recovered at the Bulldogs 34. "We didn't think (Jackson) was going to play next week, let alone this week," UH secondary coach Rich Miano said. "The guys rally around his toughness. Football's a game you play with pain, but I don't know about that kind of pain. That man is different." Six plays and 2:56 later, Rolovich lofted a pass high into the corner for Lelie, who reached over cornerback Devon Banks to make the game-winning catch. "We never gave up. When the defense caused that fumble right there, that's the only way we have a chance," Lelie said. 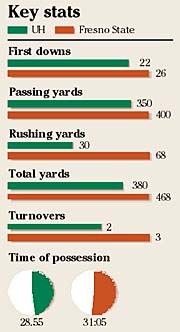 Rolovich, who completed 30 of 53 passes for 347 yards, was intercepted twice in the third quarter, and had passed for only 160 yards going into the final period. The first interception -- by Banks -- gave FSU the ball at the Hawaii 39 and set up David Shabaglian's 10-yard TD pass from David Carr. That gave Fresno State its biggest lead, 27-13, at 8:14 of the third quarter. 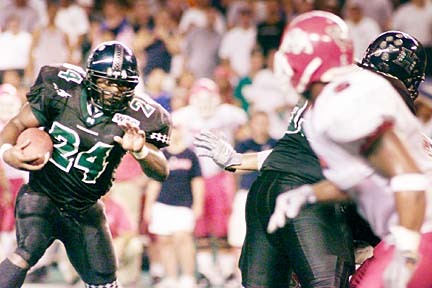 The Hawaii defense held after Rolovich was immediately intercepted again, this time by Vernon Fox. The Warriors settled for Justin Ayat's third field goal of the game, this one from 27 yards, as UH's next drive from its 25 stalled at the FSU 10. The score was 27-16 with 2:45 to play in the third. Laboy deflected a third-down pass on Fresno State's next possession. Hawaii took over on its 27, drove the field and closed to 27-24 with 11:44 left on Channon Harris' 19-yard scoring pass from Rolovich. Lelie had dropped a third-down pass at the Bulldog 20 but was hit late by FSU's Cameron Worrell for a 15-yard penalty to keep the drive alive. FSU's next series was extended by an unsportsmanlike-conduct penalty against Chad Owens on a punt. But it was stopped at the Hawaii 3 as Jackson recovered a bad snap. The Warriors then drove 96 yards on 11 plays to take their first lead, 31-27, as Rolovich hit a leaping Lelie in the middle of the end zone from 11 yards with 5:50 left. The score was set up by Rolovich's 45-yard completion on a fly pattern to Lelie the play before. The Bulldogs weren't done, though. Rodney Wright scored on a 35-yard pass from Carr with 4:55 left, making it 34-31 FSU. 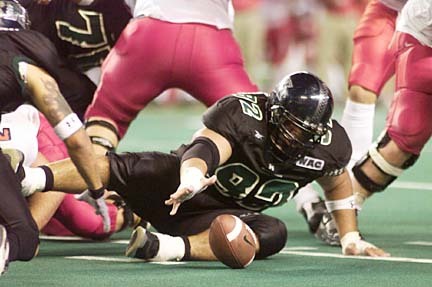 Hawaii was then forced to punt from its own 10 after Rolovich's left shoulder was injured on the next series. He was replaced for one play by Jared Flint; neither could get a first down. "My left shoulder popped out," Rolovich said. "They put it back. It's not all right. But it's OK."
Two plays after Mat McBriar's 51-yard punt to the Fresno 38, Jackson made his big hit and UH got its final chance. A pass interference call against Banks for pushing Lelie moved the ball to the FSU 7. After a 10-yard motion penalty on Hawaii, Rolovich's 5-yard scramble and a 2-yard loss on a Rolovich to Thero Mitchell pass, the stage was set. The play was called simply, "Jumpball to Lelie," Rolovich said. "When you get Ashley Lelie one-on-one, it's money," Harris said. Fresno State led 20-13 at halftime as Carr passed for two of his four TD passes, both to Charles Smith for 8 and 27 yards. Asen Asparuhov added two 35-yard field goals. Hawaii had opportunities early but had to settle for Ayat's 23 and 32 yard field goals, before finally getting into the end zone 5:58 before halftime on a trick play. Shawn Withy-Allen tossed the ball to Chad Kapanui in the UH backfield. Kapanui passed to Lelie for a 3-yard TD. Correa's interception and 45-yard return set up Ayat's second field goal. FSU--Smith 8 pass from Carr (Asparuhov kick), 12:49. FSU--Smith 27 pass from Carr (Asparuhov kick), 10:07. Haw--Lelie 3 pass from Kapanui (Ayat kick), 5:58. FSU--Shabaglian 10 pass from Carr (Asparuhov kick), 8:14. Haw--Harris 19 pass from Rolovich (Mitchell run), 11:41. Haw--Lelie 11 pass from Rolovich (Ayat kick), 5:50. FSU--Wright 35 pass from Carr (Asparuhov kick), 4:55. Haw--Lelie 14 pass from Rolovich (Ayat kick), 0:13. RUSHING -- Fresno State: Gaines 19-46, Levi 4-20, Wright 1-3, Carr 9-(minus 1). Hawaii: Bass 6-21, Stutzmann 1-5, Mitchell 2-3, Rolovich 8-1, Harris 1-0. PASSING -- Fresno State: Carr 28-45-1-400. Hawaii: Rolovich 30-53-2-347, Kapanui 1-1-0-3. RECEIVING -- Fresno State: Wright 9-145, Berrian 9-110, Smith 4-81, Greco 3-26, Smach 1-23, Shabaglian 1-10, Gaines 1-5. Hawaii: Lelie 9-122, Colbert 5-77, Stutzmann 5-50, Mitchell 4-32, Bass 4-27, Harris 3-25, Owens 1-17. Had Fresno State safety Cameron Worrell not hit Ashley Lelie late after the Hawaii wide receiver dropped a big third-down pass early in the fourth quarter, there probably wouldn't have been any last-second heroics for the Warriors. The personal foul gave Hawaii new life. Two plays later, UH quarterback Nick Rolovich found Channon Harris in the back of the end zone for a 19-yard touchdown pass to cut Fresno State's lead to 27-24. Worrell is a walk-on who wasn't really involved in the play until he came over and gave Lelie a shot long after the ball had been dropped. "We gave the game away tonight," Fresno State head coach Pat Hill said. "Too many critical mistakes, big-time penalties, just not-thinking penalties." San Jose State beat Hawaii 57-48 in a wild one last year, as Deonce Whitaker slashed across the Aloha Stadium turf for 278 rushing yards, two touchdowns running and one receiving. At the time, it looked like it might be the last the Warriors would see of Whitaker, who was then a senior in eligibility. But he'll be back next Saturday when the Spartans visit UH. Whitaker was granted another season for meeting graduation requirements in four years after entering college as a partial qualifier. Whitaker rushed for 1,577 yard last season. In five games this year, he has 339 yards and one TD in 94 carries. He did not play last week due to a sprained knee but is expected to be in the lineup today as San Jose State (1-5, 1-2 WAC) hosts Tulsa (1-5, 0-4).